A single-celled alga that went extinct in the North Atlantic Ocean about 800,000 years ago has returned after drifting from the Pacific through the Arctic thanks to melting polar ice. And while its appearance marks the first trans-Arctic migration in modern times, scientists say it signals something potentially bigger. "It is an indicator of rapid change and what might come if the Arctic continues to melt," said Chris Reid, a professor of oceanography at the Sir Alister Hardy Foundation for Ocean Science in the United Kingdom. Arctic sea ice has been in decline for roughly three decades, and in several more recent summers, a passage has opened up between the Pacific and Atlantic. In as little as 30 years, Arctic summers are projected to become nearly ice free. The findings, first reported in 2007, are among the 300 European Union-funded research papers being synthesized by a collaborative project dubbed CLAMER for Climate Change & European Marine Ecosystem Research. All of this work explores the effects of climate change on marine environments, documenting evidence of major transitions under way in the waters around Europe and the North Atlantic. The alga, called Neodenticula seminae, belongs to a group of organisms with glasslike walls known as diatoms. The diatom is not the only living thing that may have taken advantage of retreating Arctic sea ice to travel. In 2010, a gray whale appeared in the Mediterranean Sea. This species was thought to be confined to the Pacific Ocean, disappearing from the North Atlantic in the 1700s. This whale's voyage was most likely made possible by shrinking Arctic sea ice, concluded researchers writing in the journal Marine Biodiversity Research. Work compiled so far by CLAMER contains evidence of many changes within European waters. Species are moving northward — for example, fish diversity is increasing in the North Sea as it warms. Warming water is also causing problems by interfering with organisms' timing. For instance, Baltic clam spawning is timed to allow larvae to take advantage of the bloom in tiny plants while avoiding predatory juvenile shrimp. However, warming water interferes with this sequence and hurts the clam's reproduction. Yet other research documented shifts in the population of copepods, tiny crustaceans, with potentially serious consequences for fisheries, including cod, which depend on the critters for food. "The major thing about this climate change is the rate at which things are happening at this moment. … We had change, we had warming, we had cooling, we had ice ages, but it was always slower than things are going now," said Katja Philippart, a marine biologist with the Royal Netherlands Institute for Sea Research and a coordinator for CLAMER. "The rate is unprecedented." Life in the modern seas faces added stresses — pollution, habitat loss, acidification and heavy fishing — that did not exist during prior shifts in climate not caused by humans, Philippart said. The diatom that Reid and colleagues discovered in the North Atlantic disappeared from this part of the globe long ago, according to evidence found in sediment on the seafloor, Reid said. Until recently, it remained in the more favorable conditions of the Pacific Ocean before reappearing in large numbers in a plankton survey in May 1999 in the Labrador Sea. 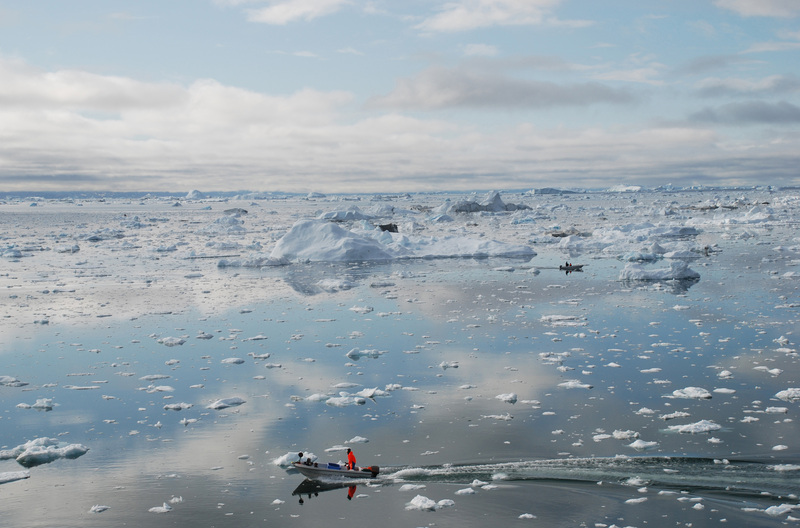 The diatom most likely traversed the Arctic thanks to melting sea ice, according to Reid and colleagues. Declining Arctic sea ice reached a milestone in the summer of 1998 when the ice pulled back completely from the Arctic coasts of Alaska and Canada, opening up the Northwest passage through which the diatom may have passed, Reid and colleagues write in their report of the diatom's return published in the journal Global Change Biology in 2007. "The diatom could act in competition with other species of diatoms or other species of algae (and) could theoretically lead to the extinctions, but I think that is highly unlikely," Reid told LiveScience. Like most introduced or returning species, it will likely settle into a niche, he said. However, its arrival is likely a precursor to others, such as fish from the Pacific, with potentially greater impacts on life in the North Atlantic, he said. "Because of the unusual nature of the event, it appears that a threshold has been passed, marking a change in the circulation between the North Pacific and the North Atlantic Oceans via the Arctic," Reid and colleagues concluded in 2007. CLAMER's work is scheduled to conclude withan international conference at the Royal Flemish Academy of Belgium, Sept. 14-15.